The hedge fund industry in 2007 in Latin America continued on its course of impressive growth over the last few years, in an environment of favourable economic conditions and markets that were increasingly resilient to turbulence in the global economy. Industry assets nearly doubled in the last two years alone and it also turned in some of the best gains among hedge funds globally (the Eurekahedge Latin American Hedge Fund Index has bested all regional Eurekahedge performance indices in terms of annualised returns over the last seven years at 20.4%). Based on the data contained in the 2008 edition of the Eurekahedge Latin American Hedge Fund Directory and other related information, we currently estimate the total size of the Latin American hedge fund space at about 330 funds managing close to US$60 billion in assets. The industry’s share of global hedge fund assets now stands at slightly over 3%, up from 1% at the end of 2000, and has grown 3 basis points during 2007. Figure 1 below gives a snapshot of the industry growth over the past decade. This review is broadly structured to inquire into some of the key aspects of the industry as they affect its participants, namely hedge funds and their investors. 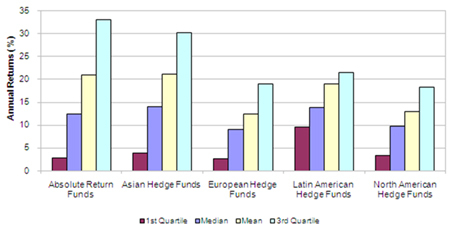 The section on hedge funds examines such salient features of the industry as fund size, geographical spread, attrition etc and their impact on the afore-mentioned growth and performance, followed by a comparative analysis of the performance of Latin American hedge funds vis-à-vis their peer group comprising of other regional hedge and absolute return funds. The hedge fund industry in Latin America saw two distinct phases of growth; the first was in the late 1990s, as wealthy local investors sought opportunities in the highly volatile regional markets. The majority of these onshore funds were (and continue to be) multi-strategy funds (refer to Figure 9 for a breakdown of assets in onshore funds by strategy) that were keen on protecting their capital in the face of turbulent markets. 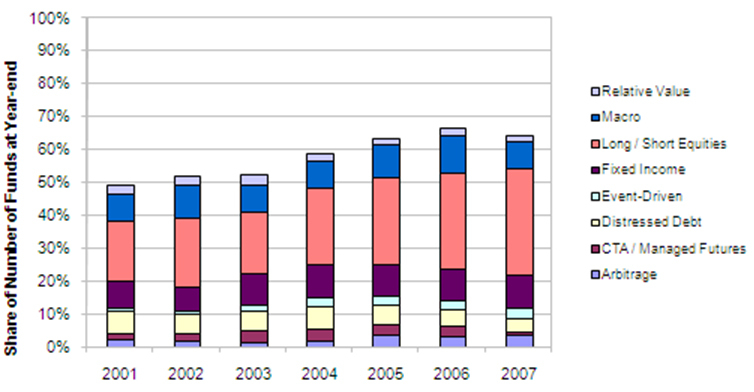 The second phase of growth was fuelled by offshore funds (typically facing fewer regulations, thereby attracting global investors) as the general economic downturn in the region in 2002 made its markets rather attractive to opportunistic players, triggering significant inflows into the region as managers with a global and/or emerging markets mandate reallocated their assets away from the emerging markets in Asia. 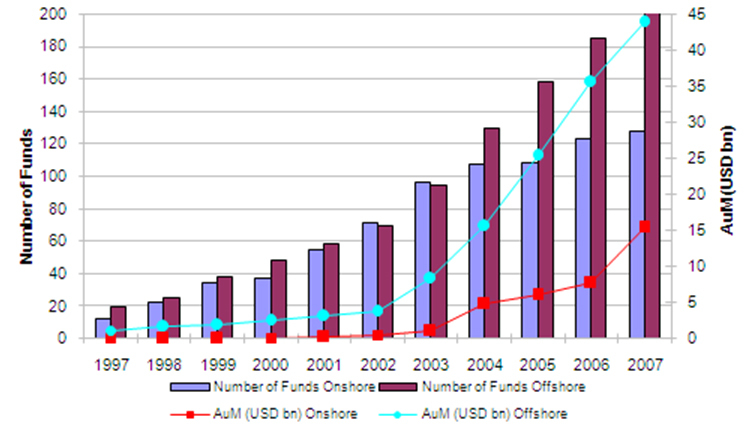 This trend is clearly discernible in Figure 2 below, with a marked upturn in the assets as well as the number of offshore hedge funds in 2003 and onwards. 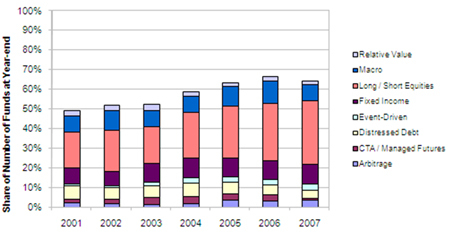 A significant number of the offshore managers are based out of Europe and the United States, with the United Kingdom alone housing more than a third of them (as shown in Figure 3 below, although this disguises the growing dispersion in this geographical make-up: the UK’s share is down from 50% in 2006). 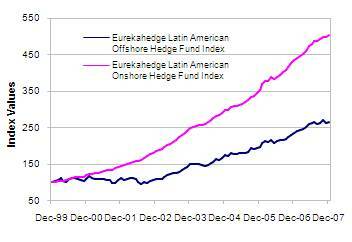 However, growth in the offshore space notwithstanding, onshore funds have had decidedly better returns over the past few years than their offshore peers (Figure 4 compares the Eurekahedge Offshore and Onshore Latin American Hedge Fund indices). To go into the reasons for the spread in returns would be to bring out the key structural difference between the two types of funds. An onshore hedge fund (strictly speaking, a Brazil-domiciled fund) is characterised by a low gross exposure (typically about 35%) and can add another layer to the returns generated by an offshore fund seeking absolute returns through an equivalent strategy, because of the embedded interest rate differentials. The spread in returns between onshore and offshore hedge funds is therefore roughly similar to the interest rate differential. It is also worth noting that this is the reason for the much lower volatility in the returns generated by onshore funds (the onshore performance curve is arguably less jagged than the offshore one as can be seen in Figure 4). 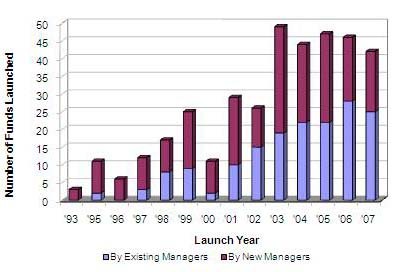 Furthermore, new hedge fund launches are increasingly being taken up by managers currently allocating to the region, rather than by new entrants, as indicated by Figure 5 below. This suggests that as fund managers hone their expertise in the region’s markets, fund portfolios are diversifying into more esoteric strategies as new opportunities emerge. The year 2002 marked a surge in hedge fund driven liquidity in the region. The funds that made the biggest leaps in asset growth were, unsurprisingly enough, those launched in 2000 and 2001 – the years immediately preceding the up-tick in inflows. By contrast, newer funds have not seen nearly as much capital appreciation by a long margin. A scatter plot of hedge fund returns during their respective initial 12 months (Figure 6) isolates the reason for this: between the state defaults in Ecuador and Argentina in 2000 and the market downturn in Brazil in 2002, hedge funds could capitalise on an array of special situations, which explains the superior performance (and tighter dispersion of returns) of funds launched between 2002 and 2004 as compared to those launched in 2005 amid buoyant regional equities. 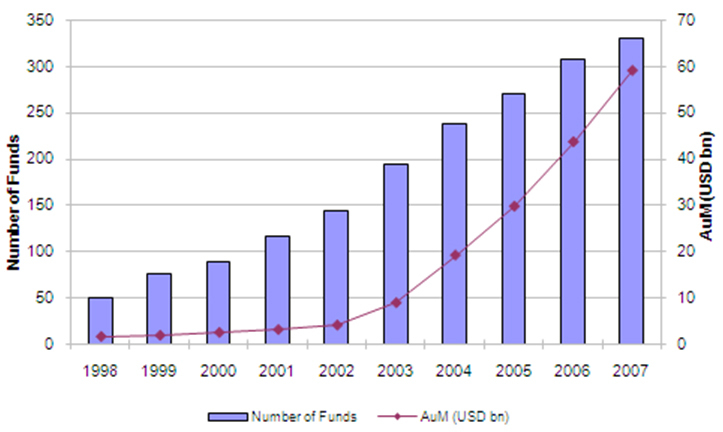 2006 too was a strong year for newly launched funds amid strongly bullish economic trends. Figure 7 inquires into the relationship, if any, between the size of a fund and its performance. 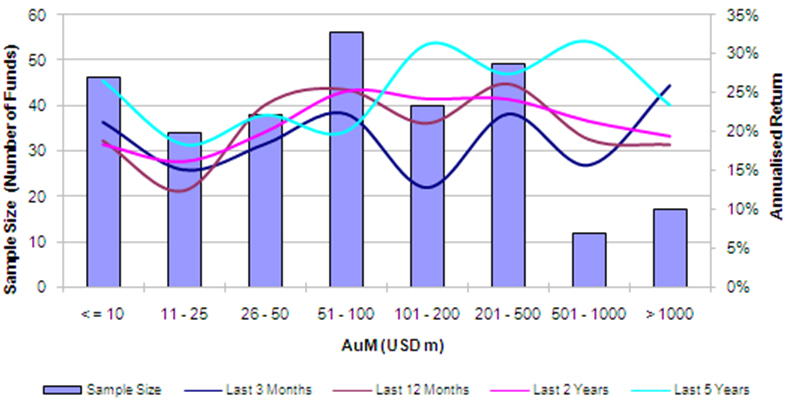 It plots the average annualised performance of 292 Latin American funds of varying sizes, over the past 3, 12, 24 and 60 months up to and including November 2007. The rationale behind this is to spot any changes in the distribution of returns by size. For instance, comparing average performance over the last two years with that over the last five years, smaller funds (< US$500 million) had a far better run between 2002 and 2004 (which boosted their annualised returns over the five-year period), whereas returns of bigger funds (US$501 million to US$1billion) were actually pulled down. The pattern of returns over the past two years, however, suggests a general trend of no clear correlation between fund size and performance for a small-sized fund (< US$500 million), but as a fund grows bigger, there are diminishing marginal returns to be had beyond the US$1 billion mark. In terms of strategies employed, as elsewhere explained, the majority of onshore funds are multi-strategy funds (accounting for close to 60% of total assets), while assets are more equitably distributed among offshore funds (Figures 8 and 9). That said, long/short equity funds are increasingly gaining currency among both onshore and offshore managers (currently accounting for 20% of total assets in either case, up from 18% last year), as equity markets in the region benefited strongly from the surge in liquidity and the healthy consolidation trends in several sectors, over the last two years. 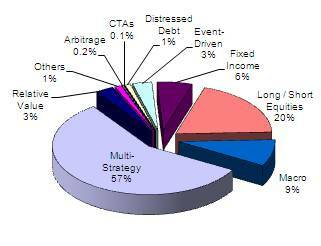 Another salient feature of offshore fund allocations among strategies is the prominence of debt-based strategies. Asian hedge funds, which have traditionally attracted equity-focused investing, offer a good point of contrast. Long/short equity funds form nearly 60% of the assets invested in Asian hedge funds, whereas debt-based strategies such as fixed income and distressed debt make up less than a tenth of total assets. On the other hand, assets in debt-based strategies add up to a good quarter of offshore hedge fund assets in Latin America. Figure 10 above traces the historical changes in the region’s hedge fund strategy mix over the years, with the balance being made up by multi-strategy funds. Multi-strategy funds now form just over one-third of all Latin American funds (in contrast with 50% five years ago), and are gradually giving way to specialist and opportunistic strategies such as long/short equity, event-driven and relative value plays. Also, most of the larger regional economies are buying back their debt in the light of significant balance-of-payments surpluses. With receding foreign debt and credit spreads at an all-time low, there is now more interest in local currency debt and equity markets. And finally, Figure 11 compares the performance of Latin American hedge funds across strategies, over the past five years. Returns across strategies have largely remained consistent with event-driven, long/short, macro and relative value funds generating upwards of 20% annualised returns. The notable exception is CTA/managed futures funds, which have experienced a sharp downturn in the last one year, but have recovered in more recent months amidst rising commodity prices and strengthening domestic currencies. The broadening scope of opportunities in Latin America is a discernible theme on an analysis of the geographic focus of hedge funds as well. While the region-specific allocations of onshore funds are a given, offshore funds too are making inroads into country-specific investment avenues, as can be seen from the emergence of Brazil- and Argentina-focused funds (from generic ‘Emerging Markets’ and ‘Latin America’ mandates). Figures 12 and 13 give the current size of allocations in the region (for instance, Figure 12 tells us that over half of offshore fund assets parked in the region come from funds allocating to the ‘Emerging Markets’1 , while another 34% come from those with a ‘Global’1 investment mandate). 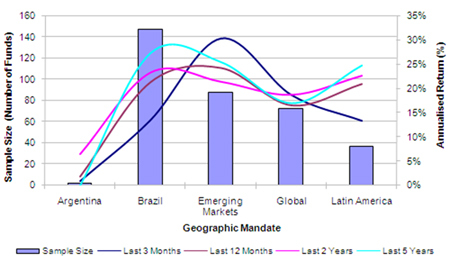 Figure 14 further buttresses the case for expanding markets, by looking at the shares (of total number of funds) of each of these geographic mandates over the past six years (the remainder being made up of funds allocating to Brazil). There are two aspects to this changing investment landscape: a) funds allocating specifically to Latin America have nearly tripled their share of total funds in the region (from 3.5% in 2001 to the current 11.8%), while those with an ‘Argentina’ focus now form 1% of all Latin American funds (up from virtually none three years ago); b) funds allocating to the region as part of a broad ‘Emerging Markets’ focus, are losing ground to region-specific funds (‘Emerging Markets’ funds now form only 24% of all Latin American hedge funds compared to 37% in 2001); and c) funds with a ‘Global’ mandate are increasing their Latin American allocations (‘Global’ funds now make up 21% of all funds as opposed to 13% five years ago). To test whether this shift was supported by the superior performance of Latin America-focused funds, we annualised and compared returns across regional mandates, over the past 3, 12, 24 and 60 months. This is depicted in Figure 15 along with the respective sample sizes used in the comparison. While Brazil remains the best-performing region over the past five years, the more recent returns (note the line graph for ‘Last 12 Months’ performance’) have been in favour of broader Emerging Markets mandates, given the impressive performance of Eastern European, Indian and Chinese markets in 2007. Funds allocating to Argentina, on the other hand, have had to deal with a change of the political guard and the attendant risks in 2007, and have seen dwindling returns in recent months. The rate of attrition is another good measure of an industry in its ‘growth’ phase. In this section, we look at attrition rates in the Latin American hedge from two angles: 1) which funds became obsolete and 2) when they became obsolete (with a shorter life span serving as a proxy for poorer performance). 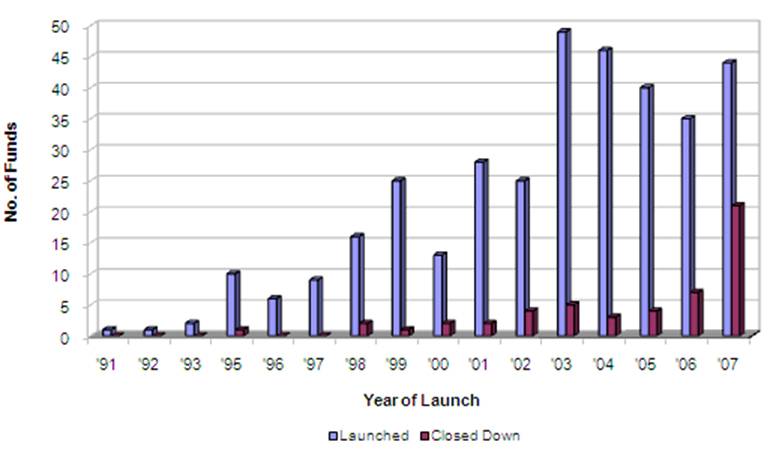 Figure 16 achieves the former by comparing the number of funds (both launched and dead) by year of launch, while Figure 17 takes on the latter by comparing Latin American funds that were operational for less than one year against other such funds in Asia, Europe and Latin America. 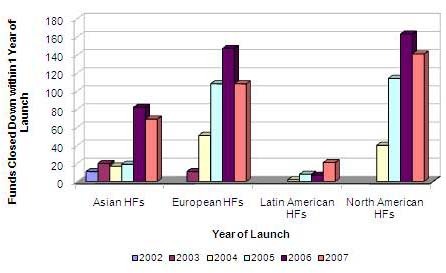 Figure 16 shows simultaneously two aspects of the growth in the Latin American hedge fund industry – progressively more launches and a corresponding spurt in the number of dead funds – signifying a rush of entrants into the market. Also of note is the fact that the spikes in the number of obsolete funds correspond with the changes in the economic landscape that triggered the growth in the first place (years 2002 and 2003 in the graph). 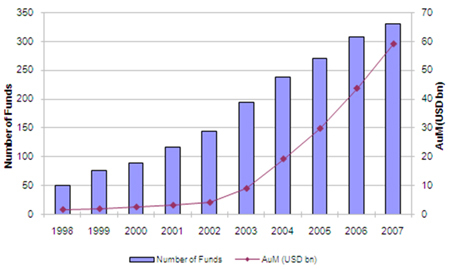 Also, 2007 has seen a marked up-tick in the number of fund closures, partly owing to the turbulence in global financial markets during the latter half of the year. Figure 17 compares funds that have operated for less than one year before becoming obsolete, across hedge funds in different markets. 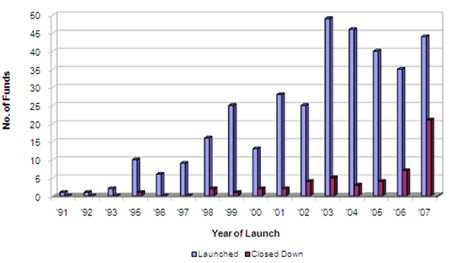 The fact that all of the funds that died within one year of their launch (irrespective of the markets they chase) were launched in or after 2001 is an indicator of the flurry of new entrants globally. This explains the spikes in the number of dead European and North American funds, as newer funds struggle in an environment of limited opportunities. In Asia, on the other hand, heightened launch activity (owing to the attractiveness of the region’s markets since the turn of the century) coupled with obstacles to capital-raising (investors’ money tended to chase only a few well-known funds) led to the increased numbers of short-lived funds over the last five years. With the wave of growth seen since 2003, Latin American hedge funds too seem to be at the incipient stages of a similar predicament. Nearly four-fifths of the sample hedge fund dataset charges an incentive fee of 20% (average fee charged for the sample of funds stands at 19.5%2). Developed market funds tend to charge slightly more than their emerging market peers (the average for European and North American funds stands at about 19.75%, while that of Asian funds is nearer 19.4%). This has partly to do with the high levels of launch activity in emerging markets, with start-up funds not being able to command as much in fees as well-established players in developed markets. This inverse relationship between incentive fees and performance seems to specifically apply to Latin American hedge funds as well for similar reasons. 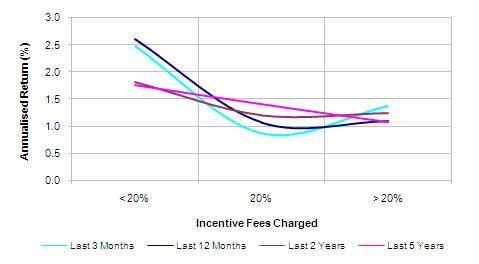 Figure 18 plots the annualised returns generated over the past 3, 12, 24 and 60 months per percentage point of incentive fees. Fees are categorised as “below 20%”, “20%” and “above 20%”. To illustrate, a fund generating a 40% annual return to investors after charging a 20% incentive fee, would mean that every percentage point of fees translates into 2-1/2 percentage points in returns. As can be seen from Figure 18, over a five-year term, this ratio was relatively flat. But during the more recent 3- and 12-month terms, with the expanding selection of fund offerings, funds charging below 20% have significantly outperformed those charging fees of 20% or above. In this section, we compare hedge fund returns over the 12-month period ending November 2007 across investment regions as well as investment modes, to see how Latin American hedge funds match up against their peers. To that end, Figure 19 below depicts the 1st, 2nd and 3rd quartiles and the mean of the last 12 months’ return of various alternative investment vehicles3 as well as a benchmark equity index – the MSCI EM Latin America Equity Index. In Latin America, for instance, we took all the funds’ annual returns over the past 12 months (from December 2006 to November 2007) and ranked them in ascending order. 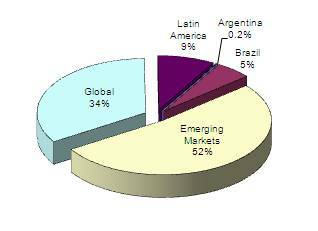 The bottom 25% (ie the 1st quartile for Latin America in the figure) returned less than 10% for the year. Several interesting points emerge from this comparison. For one, all funds have means (ie average returns) greater than their median returns (ie middle values). 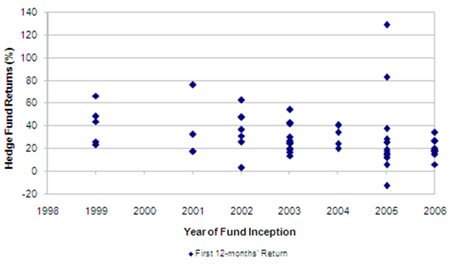 This is typical of hedge fund returns which usually display positive skewness, ie a greater concentration of data on the positive end of the return spectrum. Despite comparable top-quartile returns among Latin American, European and North American allocations, it is worth noting that the actual mean and median values reflect better quality returns among allocations to Latin America. Furthermore, the narrower dispersion of returns implies more consistent performance among Latin American funds. 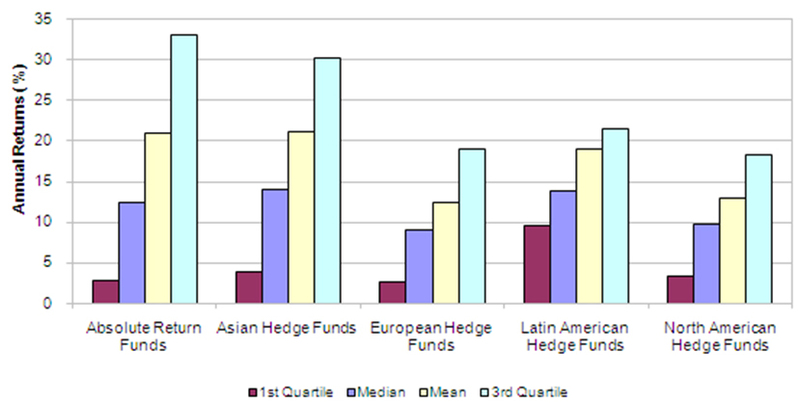 To elaborate, the significant difference in inter-quartile ranges (difference between the positional values at the 25% and 75% marks, ie between the 1st and 3rd quartiles) between Asian and Latin American hedge funds and absolute returns funds on the one hand, and North American and European hedge funds on the other. Simply put, 50% of the respective data points for each type of fund falls within these inter-quartile ranges. That is to say, an investor choosing to park his money in an arbitrarily selected North American fund would have a 50% chance of making a return of anything between 3% and 16%, whereas investing the same money in an equally arbitrarily chosen Latin American hedge fund would fetch him over 9% annual returns, 75% of the time. And lastly, long-only absolute return funds had a terrific start to the year because of persistent bullish trends during the first half, but as is evident from the bottom-quartile returns (0.7%), they have had to contend with rising uncertainty and volatility in the underlying markets during the latter half. On the whole, 2007 was a good year for hedge funds in Latin America, with average annual returns at a robust 15%, although lowered levels of liquidity, tightening credit conditions and heightened volatility in the underlying markets have dented performance during the latter half of the year. Despite the uncertainty currently persisting in the global financial markets, economic and political news in the region continues to be generally positive; in Venezuela, President Chavez suffered a setback early in December in a national referendum for a series of constitutional changes; in Brazil, the past year has seen strong growth in the residential housing demand, as also in investments, while inflation remains under control; in Mexico, recent tax and infrastructure reforms, devised to counter the negative impact of the slowing US economy, should catalyse growth. That said, a possible recession in the US and rising global inflation, spell a potentially challenging year ahead for Latin American markets. We believe the current economic environment could create compelling investment opportunities for hedge funds in the region, albeit within the confines of conservative strategies; for instance, many attractive small- and mid-cap companies have seen their share prices drop 20-40% in the last four months, and therefore offer significant long-term value. Furthermore, the volatile trading environment ensures a significant opportunity-set of mispriced assets, and we foresee niche opportunities in the arbitrage, relative value and distressed debt spaces. 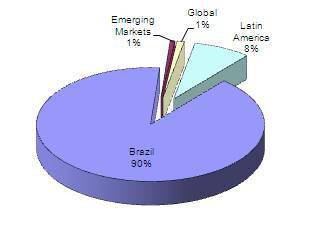 1 These refer to ‘emerging markets’ and ‘global’ funds that have partial allocations to Latin America. 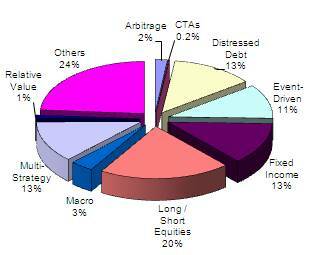 2 Based on a sample set of 245 hedge funds. 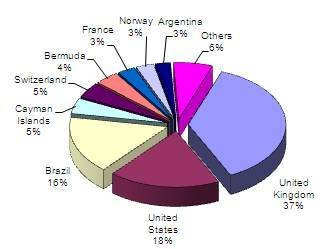 3 The sample set included 197 Latin American, 581 Asian, 871 European, 1,153 North American and 228 long-only funds.